The cross-border ski area of the Portes du Soleil has an international vocation, offering you the very best skiing in twelve resorts, 196 high-tech ski lifts and 300 pistes: ski your heart out! Snow and sun are there in force, and they don’t stick to the border. With the Portes du Soleil «handsfree » ski pass you are totally free to ski, at Châtel, Avoriaz, Morzine, Les Gets, Saint Jean d’Aulps, Montriond, Abondance and La Chapelle d’Abondance on the French side, and at Morgins, Torgon, Champoussin, Les Crosets and Champéry on the Swiss side. The Châtel ski domain itself offers a wide range of superb holidays and magnificent opportunities for skiing, both for those who come for the life and scenery on the mountain and those looking for that ultimate experience on the slopes! 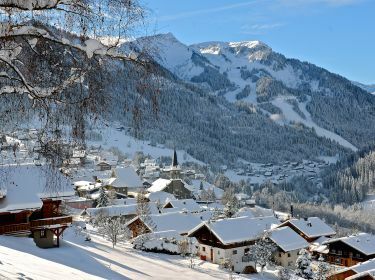 It extends across two massifs: Super-Châtel / Barbossine and Linga / Pré-La-Joux / Plaine Dranse, and not forgetting the village lift too and comprises 46 ski slopes : 6 black, 14 red, 17 blue and 9 green with a total length of 83 km and 43 ski-lifts. From Châtel there are direct links to the resorts of Avoriaz, Torgon and Morgins,giving you access to the huge Portes du Soleil ski area.It is also valid throughout the Swiss resort of Torgon, in the Corbeau sector of the Swiss resort of Morgins and the La Braitaz sector at La Chapelle d’Abondance (including the Panthiaz gondola lift). So with a Châtel ski pass you can use 54 ski lifts and 66 pistes totalling some 130 km (80 miles). If you prefer to ski a vast area, go for the Portes du Soleil ski pass!